This talk will be open for all colleagues from any faculty to attend, and should finish no later than 5.30pm (including a brief Q&A if you have any questions/discussion points!). December-Meeting of the Centre of Film & TV research at December the 12th, at 4 p.m., in W240. 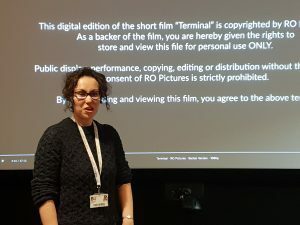 Our member Dr Samantha Iwowo screened a section from the movie “Oloibiri”, for which she wrote the screenplay, and discuss the work on it as well as the response the film got with us. We discussed aspects of transnational and post-colonial cinema research in context of productions from and about Nigeria/Africa. “Oloibiri” is an enlightening film that makes it easy to comprehend the plight of the Niger Deltans abandoned by the government and oil multinationals. CFTV meeting at November 28th, 2018. 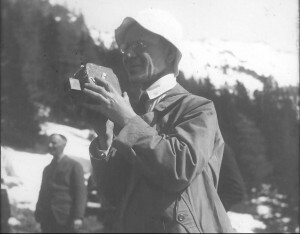 The Goldberg-Condition as a documentary film is part of a collaborative research project. Partner were the Museum Technical Collections in Dresden, TU Berlin and the Academy for Graphic and Book Art in Leipzig, all Germany. The project was supported by Robert-Luther-Foundation; Kulturfoerderung des Landes Sachsen, BU, and the family Gichon. Kerstin Stutterheim, director and producer of the documentary together with Niels Bolbrinker, was as well co-curator for the exhibition and head of research of the project. 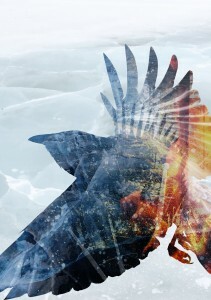 She will introduce background, process and outcome of this collaborative work. After the film screening will be time for Q&A. Refreshments and some snacks will be served. On June 6th the Centre for Film and TV Research is hosting a panel on Screenwriting Research with international experts in this field. These experts are all members of the board of the international Screenwriting Research Network. We would like to invite you to discuss issues relating to Screenwriting Studies and research in relation to all screens, not just TV or cinema. The event will open with a short Introduction to Screenwriting Studies by Ian MacDonald, Senior Lecturer at Leeds University, UK. The panel guests will briefly introduce their individual approaches to Screenwriting Research, which includes both traditional and artistic research in an academic context. Apart from Ian MacDonald, we are pleased to welcome Carmen Sofia Brenes (Chile/Uruguay), Virginia Pitts (UK/NZ), Kerstin Stutterheim (UK/Germany), Ronald Geerts (Belgium), and Claus Tieber (Austria). The panel presentation will be concluded with a short presentation by Kerstin Stutterheim outlining questions & challenges for the future of Screenwriting Studies. The presentation will be followed by a Q&A with the panellists, and then informal mingling between panellists and attendees over drinks and snacks. An Evening with Billy Williams, OBE, BSC. Williams will discuss his extraordinary career as one of the UK’s most influential cinematographers. In a career spanning 50 years he has filmed over 40 films, including some of the most celebrated in film history, including Women in Love (1969), Gandhi (1982), for which he won an Oscar, and On Golden Pond (1981). The evening will conclude with a screening of Women in Love, which Williams recently digitally re-mastered for the BFI, Blu-ray release. Women in Love; directed by Ken Russell, starring Glenda Jackson (who won an Oscar for her performance) Alan Bates and Oliver Reed are critically acclaimed with some remarkable experimental filming techniques which Billy will discuss in his talk. This is a free event, open to students, staff and member of the public. Refreshment will be served in the 3rd floor Fusion Café from 6pm prior to the talk and screening in The Share Lecture Theatre at 7pm. My current research project is an analysis of the dramaturgy and aesthetics used to make ‘Game of Thrones’ a success. This will help to understand the emotions and the attractiveness of this TV production. 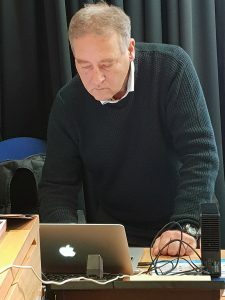 My research in the field of film dramaturgy can support a better understanding of the power and the techniques of audio-visual narration in performance works – based on practice-based research as a sub-discipline of aesthetics. Film dramaturgy can not only support our film and TV students to learn their skills but also enable professionals, supporter, and decider of any kind, journalists, and fans, to understand film and media productions as work reflecting reality. Although ‘Game of Thrones’ is fantasy-series, it reflects the Zeitgeist – the situation we are currently living in. My research will look at how this series is representing high-quality of filmmaking, representing Gender, as well how it is reflecting concepts of the world we live in or our fears about it. Dr Trevor Hearing is developing a novel model of television practice to explore new ways of making broadcast experimental television. 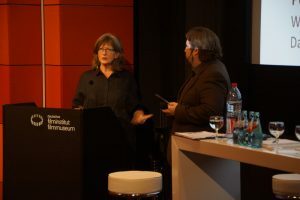 The project invokes the legacy of experimental television studio drama from the 1960s and 70s, although documentary can also find a new space in the proposed formats. The work builds on the concept of the “para documentary” developed in his PhD, to create the innovative idea of a “studio documentary” form. Drawing on interdisciplinary methodologies loosely corralled under the umbrella of “Digital Humanities”, the chosen subject matter for testing the model is a series of programmes investigating the historiography of conspiracy, bringing together a variety of television forms to explore the social, historical and cultural dimensions of conspiracy theories. Underpinning the work is the notion that we need to address a broader societal imperative to find ways to communicate complexity through popular cultural forms in a world currently dominated by the populist appeal of simplistic narratives and solutions. The aim of this practice-led research is to explore the ways in which the political and social power structures between filmmaker and protagonist are manifested in the aesthetics and cinematic means of documentary film. Through a synthesis of filmmaking practice and “hidden knowledge” with critical theories from the fields of cultural studies and political philosophy the research will devise methodological approaches to the critical analysis of documentary films in light of the political and material conditions of their emergence. 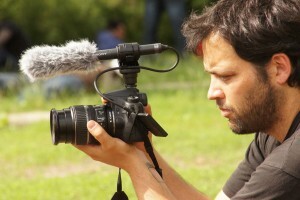 By exploring filmmaking practice, both through the practical aspects of the research as well as through experiences made and reported by filmmakers, and placing those in the context of wider theories pertaining to issues of power structures and representation, it will shed light on the different aspects which must be considered when approaching the analysis of a documentary film for its ideological and political content. The work also asserts that in order to fully understand and analyse a documentary film, a wider range of factors must be considered, most prominently the material conditions of the filmmaking process. Those include the financing and commissioning of the film, the conditions of its production as well as its distribution and reception. Drawing on methodologies of dialectical materialism in cultural studies, the research will approach the studied films as well as the practical experiences in a holistic fashion, placing them in historical, political and cultural processes instead of viewing them as isolated texts divorced from social context. I propose to produce, direct and record a rehearsed reading of my screenplay Bangkok Butterfly, which is a contemporary, gay adaptation of the Madame Butterfly story. This will take place in a TV studio or a lecture theatre on campus, illustrated with appropriate visuals, and be recorded, multi-camera, by students. We will invite an audience of as wide a range of ages, interest, and backgrounds as possible. The reading will be followed by a Q and A with the writer/director and members of the cast. The audience will then be asked to complete an anonymous survey about their responses to the potential film, and, in particular, whether it is one which would attract them into the cinema. If so why? Or if not, why not? We will ask them to identify themselves only in terms of age, gender and sexual orientation. The Centre for Film and Television seeks to stimulate and sustain a highly visible research culture for staff and research students within the broad areas of academic research resulting out of film and television traditions and practices. Within a changing media environment, we want to reflect and discuss traditions and practices as well as encouraging researcher to think and reflect about practices for future media platforms, practices and distributions. The aim is to connect artistic and academic-research, practice-based and practice-led in an inspiring and challenging way to contribute to regional as well as international discourse in our area. establish a coherent unit that is able to most effectively achieve the University’s strategic aims and objectives in the area of research. 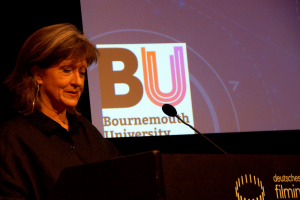 ensure that the research activity of staff and research students will be in an appropirate way made visible to the outside world; and that Bournemouth will be recognised as a leading film and television research hub. play a leading role in developing our knowledge and understanding of film and television practice and practices.